Here you find the most common questions about GROHE Blue. If you can't find the answers to your questions, please contact us. Can cold water be chilled? Yes, there is a GROHE Blue Chilled and Sparkling version. Does GROHE offer sparkling water? When should the filter be changed? GROHE Blue® systems also offer you a choice of filter size as well as three filter type options, meaning you can get perfect drinking water whether you live in a hard or soft water area. Ideal for soft water areas, the activated carbon filter improves the taste by removing chlorine and metal substances but does not filter out carbonate hardness. Enjoy additional health benefits by choosing the Magnesium+ filter model. It uses our five-step filtration process and it also adds magnesium to the water. Something of a tea and coffee connoisseur? Then this is the option for you, with the added magnesium delivering the best-tasting tea and coffee possible. Are the different sizes of filter interchangeable? Yes, all filters have the same connections. Does the water need to be isolated when changing the filter? No, there are isolating valves built-in to the filter head. When the filter is removed it automatically shuts off the water. What are the differences and main advantages of GROHE Blue filters compared to other brands? The main benefit is that we have an Ion exchanger and that specially reduces carbonate hardness and binds heavy metal ions such as lead and copper. Most of the competitors filters are only an active carbon filter taking out chloride. Does the filtered water come into contact with non-filtered water? No, there are separate waterways inside the tap. The filtererd water outlet is slighly longer at the spout guaranteeing no cross contamination. Is power required for the tap to work? Power is required for the electronics that control the filter indicator on the GROHE Blue® filter handle. If power is shut off then the tap will still work and provide filtered water for the life of the filter. Yes, the filter can be disposed of as normal plastics. Currently we do not refurbish the filter for re-use. Where should the electronic pack be installed? The electronic pack should be installed in an area under the sink with minimal obstruction. Obstruction of the sensor on the electronic pack can affect the accuracy of the filter life indicator. What finishes are available for GROHE Blue? Chrome (product number ending with 000 or 001) & SuperSteel (product number ending with DC0 or DC1). Are the carafes available to purchase? 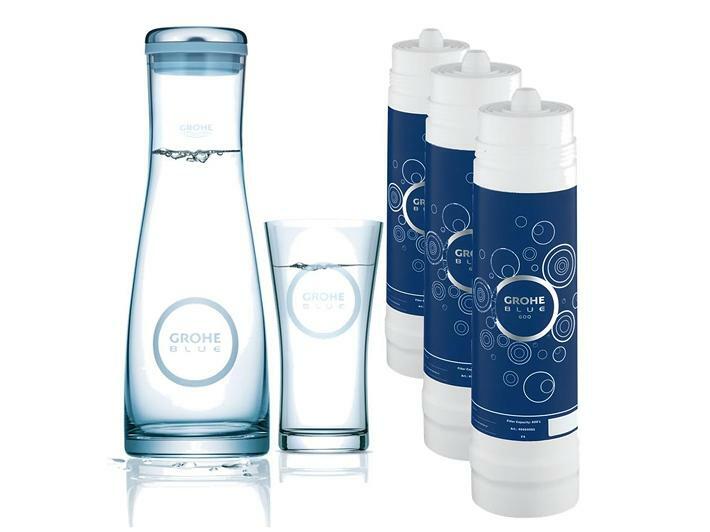 Yes, carafes (40 405 000) can be purchased in the GROHE webshop. Can the current GROHE Blue system also be retrofitted with the cooled/carbonated version in the future? Yes, the system can be retrofitted. Please call GROHE on 0871 200 3414. What functions does the GROHE Blue Chilled & Sparkling have? What does the GROHE Blue Pure Starter Kit contain? The Starter Kit contains the tap, the filter, a filter head, and a glass carafe. What does the GROHE Blue Chilled & Sparkling Starter Kit contain? What are the capacities of the different CO2 bottles? Can the water pressure burst the filter? Yes. The filter has approval for up to 8.6 bar. A pressure-reducing valve must be used above 5 bar. How does the filter work? How does the fitting detect that 600 liters have actually flowed through the filter given that local flow rate conditions can vary? The electronics are adapted to the local flow rate conditions during installation. The electronics unit is adjusted as per the Installation instructions with the help of the GROHE Blue carafe or a 1-litre measuring cup. Can I adapt the filter to different water hardnesses? Yes, the filter can be adapted to different water hardnesses. There is an adjusting screw on the top of the filter head. Contact your local water supplier for the necessary data. How long can the unused filter be stored for? The filter has no expiration date, provided the packaging is not opened. What happens if I do not use the filter for an extended period of time? GROHE recommends not leaving the filter system out of service for extended periods of time. If the GROHE Blue filter system is not used for a few days (2-3 days), the filter system must be rinsed with at least 4 liters of water. The filter system must be rinsed with at least 20 liters of water or replaced in its entirety after stagnation times of more than 4 weeks. What happens when the filter is full? Will water still come out? Yes. When the filter is depleted, it will no longer be able to purify the water but will allow normal tap water (drinking water) to pass through it. Can I also use commercially available filters in the system? No, the filter is specific to GROHE. How high is the flow rate? Flow rate at 3 bar flow pressure: fitting approx. 9 l/min, filter cartridge approx. 4 l/min. Why should I drink GROHE Blue water? I keep hearing that tap water is top quality. So why should I purchase GROHE Blue? GROHE Blue purifies the already good quality tap water. Substances which are important for the body such as calcium and magnesium are retained, while the lime content is reduced and elements which affect taste such as heavy metals (iron, copper), chlorine and organic substances are filtered out. What about minerals? Will I get enough minerals by using GROHE Blue? 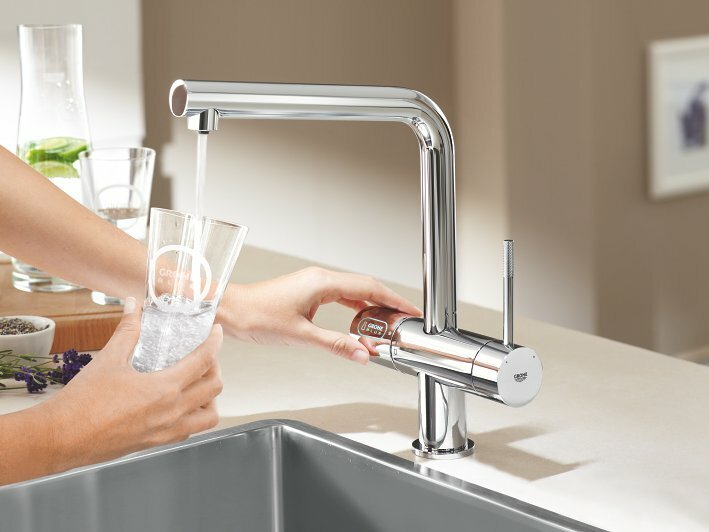 The GROHE Blue system does not change the mineral content of your tap water. Contact your local water supplier for details about the mineral content. Enjoy additional health benefits by choosing the Magnesium+ filter (40 691 001). It uses our five-step filtration process and it also adds magnesium to the water. Something of a tea and coffee connoisseur? Then this is the option for you, with the added magnesium delivering the best-tasting tea and coffee possible. Where can I purchase GROHE Blue? GROHE Blue can be purchased from specialist bathroom or kitchen retailers. Are GROHE Blue glasses also available? Yes. The Article number is 40437000. You can puchase a set of 6 glasses in the GROHE webshop. What are the advantages of GROHE Blue for the consumer? Fresh taste – Water simply tastes better when it is fresh – ideally direct from the spring. This taste can now be experienced at home with GROHE Blue. A blind test proved that GROHE Blue water tastes at least as good as the leading brands of mineral water and is even better in terms of freshness of taste. Fresh and convenient – GROHE Blue produces a high-quality water which bubbles out of your own home spring in an instant. For you, this means no more carrying home bottles of water. Protection of the environment – The production and transport of bottled mineral water is harmful to the environment. GROHE Blue makes both unnecessary. Can I vary the supply of bubbles? Where can I purchase a refill of the C02 bottles? You can buy a refill of four 425g CO2 bottles (40 687 000) in the GROHE webshop. Please contact GROHE for a refill of a 2kg CO2 bottle (40 424 000). Where do I obtain larger C02 bottles? A 425g bottle is delivered with your starter kit. To upgrade to a 2kg bottle which provides up to 350 liters of sparkling water, contact GROHE. Are the CO2 bottles safe for me and my family? The 425g CO2 bottle you can store everywhere. GROHE recommends that you store the 2kg bottle only in rooms with more than 13 m². Can I get an installer to connect my CO2 bottle? Where is the filter installed? It is installed underneath the tap (e.g. invisibly under the sink). Either directly at the cooler or in another easily accessible location near the cooler. What does the GROHE Blue filter remove? The filter cartridge reduces the water hardness of the drinking water as a function of the adjustable hardness of the water. Furthermore the cartridge binds heavy-metal ions such as lead, copper and cadmium. It also reduces cloudiness as well as organic and taste-impairing constituents and chlorine residues. Contact your drinking water supplier for water analyses. How long does the small filter last? Service life approx. 600 liters (10° dH) or max. 12 months. The litre amount depends on the carbonate hardness of the water, not the overall hardness. Will I also be able to purchase replacement filters in the future? Yes. We provide an availability guarantee for the filter. How do I dispose of the filter? The filter can be disposed in normal domestic waste. The activated carbon it contains improves its combustibility in incinerating plants. Do I need to call an installer to replace the filter? What prerequisites must be in place in order to use the tap? The tap can be operated with pressurised storage heaters as well as thermally and hydraulically controlled instantaneous heaters. It cannot be operated with unpressurised storage heaters (displacement water heaters). Can I draw water even in the event of a power failure? Only normal water can be drawn in the event of a power failure. GROHE Blue water cannot be drawn. How does the mousseur work? It is a special two-piece flow straightener which keeps the water channels of the tap water and the filtered GROHE Blue® water separate. Yes, 5 years from date of purchase. How cold can I make the water? The water can be cooled down as far as 4°C depending on the ambient temperature. Can I also use GROHE Blue water in other kitchen appliances (e.g. coffee machines)? Yes, it is ideally suited for kettles, etc. since the reduced lime content of GROHE Blue water protects the appliances. GROHE Blue is also well suited for this. Despite the reduced lime content, there is still enough lime in GROHE Blue water to make drinking tea and coffee enjoyable. With this method of beverage preparation, lime acts as a flavour carrier and should never be filtered out of the water completely. Does GROHE Blue not filter the essential calcium from the drinking water? No, GROHE Blue only reduces the carbonate hardness of the water, all of the essential minerals remain in the drinking water. Only substances which are of no importance for humans are removed from the water, which is why we talk about purification. Does the GROHE Blue water really taste so great? Yes. A representative group was given water including GROHE Blue and leading brands of mineral water for a blind tasting. The result was that GROHE Blue water tastes as good as the mineral waters and was even better in terms of freshness of taste. The cooler of GROHE Blue Chilled & Sparkling is making a lot of noise, what can I do? Please buy a piece of foam/rubber mat to reduce the sound which is being produced by the cooler, make also sure that the cooler stays straight! Is GROHE Blue suitable for baby food? That depends on the quality of the drinking water. In principle, however, it is recommended to only use special shop-bought water for baby food in the baby’s first year. GROHE Blue filters use a five-step filtration process to remove even smallest particles from tap water, while leaving behind all the important minerals. GROHE Blue systems offer you a choice of filter size as well as three filter type options, meaning you can get perfect drinking water wether you live in a hard or soft water area. For people who prefer still water only, GROHE Blue Pure is the ultimate solution. Better tasting than tap water, better for the environment than bottled water, and much more convenient for you, GROHE Blue Pure offers drinking water of ultimate purity. 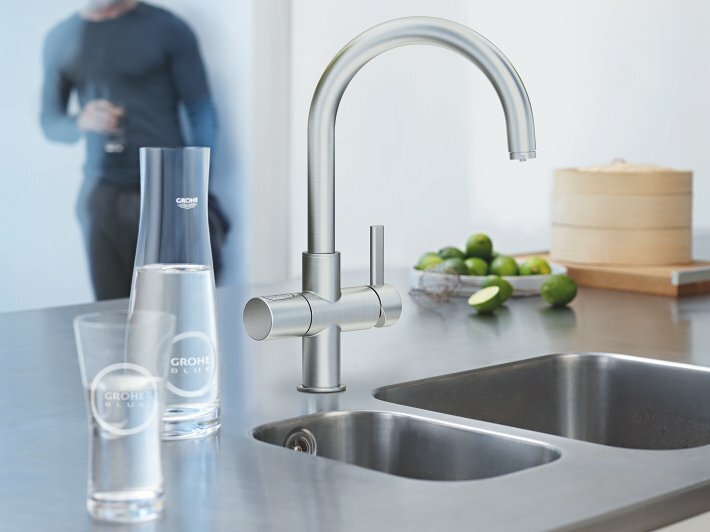 Save money with GROHE Blue: Great-tasting GROHE Blue costs just one fifth of the price of premium waters. You reduce your energy consumption and avoid huge quantities of plastic waste!